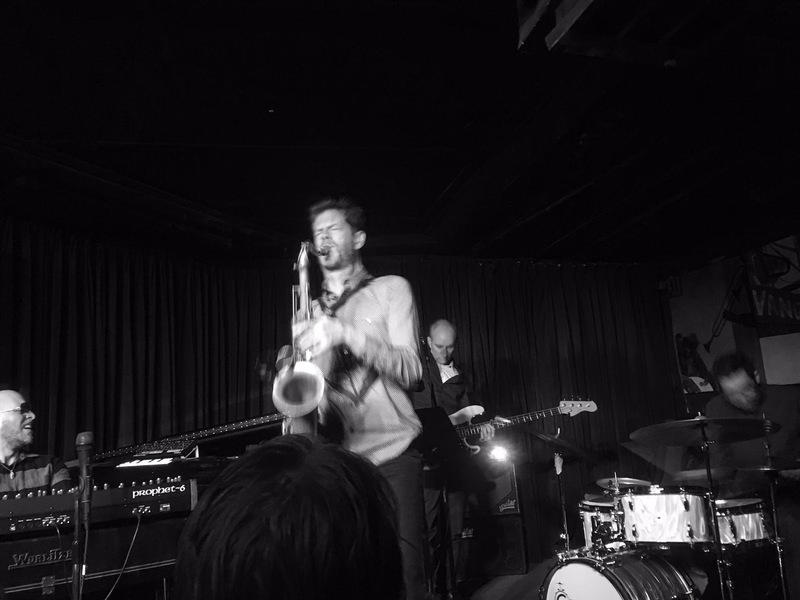 The Donny McCaslin Quartet at the Village Vanguard. On the first Friday in February I went to New York’s Village Vanguard for the first time, to see tenor saxophonist Donny McCaslin’s quartet with Jason Lindner (keyboards), Nate Wood (bass) and drummer Mark Guiliana. The purpose of my NYC trip was graphic design, not music, but as a typographer friend once noted: "You can’t go to New York without going to a jazz club!" Yet I’d been to the club many times before: in my imagination; in my record collection; and in onscreen. It features in the new documentary Bill Frisell: A Portrait, and as a teenager I obsessed over an LP of the Thad Jones/Mel Lewis big band recorded in the small West Village club. Later, I bought the Impulse album Coltrane ‘Live’ at the Village Vanguard – a classic that includes Trane’s glorious version of Softly, As In A Morning Sunrise. So it felt like home, almost as familiar as the Vortex in Dalston, or the Crypt in Camberwell. The walls (like those of Ronnie Scott’s in London) resonate with jazz history, covered with photos of jazz legends. A band like McCaslin’s can’t fail to be intensely conscious of the great musicians who have gone before them, especially the towering tenor saxophonists who have performed and recorded there: Coleman Hawkins, Sonny Rollins, George Coleman, Joshua Redman, etc. McCaslin also has the weight of rock’n’roll history on his shoulders. He was one of David Bowie’s closest collaborators on Blackstar, the pop legend’s final album. McCaslin’s musical fingerprints are all over the record, particularly on tracks such as Dollar Days and Sue (or In A Season Of Crime), co-composed by genius bandleader Maria Schneider, with whom McCaslin played for many years. Three of the quartet (except Wood) were involved in Blackstar, and would have been in the live band had Bowie survived the cancer that killed him in January 2016. So McCaslin and his comrades invade the tiny Village Vanguard stage with the air of battle-scarred, happy-go-lucky veterans, determined to complete another difficult mission. Their music is hard as nails, with the glittering surface of hard-programmed musicality you get in jazz players born since the mid-1960s. They don’t ‘swing’ in the traditional sense, yet every number has the free-flowing looseness you associate with the great jazz quartets, from Monk and Coltrane through to Wayne Shorter, Joe Lovano and beyond. The association with Bowie could have stymied a less assured bunch of musicians, missing their chance on the big stadiums and digital platforms, always wondering about what might have been. Or they could have ended up working with lesser-name celebrities, politely trying not to blow them off stage. Happily, they make music that’s unquestionably jazz, but inflected by a kind of art-rock edginess that’s quite hard to do in a contemporary way (as evidenced by the large number of dull Radiohead jazz covers). Lindner’s choice of keyboard sounds can steer them closer to European prog-era jazz-rock than US fusion, but Guiliana’s drums keep the feel rooted in American soil. They even add a few left-field vocals: a dead-pan performance by Wood on the encore Club Kid and some harmolodic chorus shouts (by Lindner and the leader) on their explosive cover of Bowie’s Look Back In Anger (from the 1979 album Lodger). The band’s more typical approach could be described as ‘anthemic’, creating a broiling sea of sonic richness over which big melodic lines can sail, as on Bright Abyss (from McCaslin’s 2016 album Beyond Now) and the as-yet untitled opener. The number provisionally titled Wild Sequence of Events emerges from a magnificent keyboard cadenza to morph into a sort of reinvented reggae, with Wood’s damped bass and choppy, minimal beats from the meticulously energetic Guiliana. Their set is magnificently professional, but with the spirit of a jazz workshop rather than a ‘show’. McCaslin starts the third number with an extensive cadenza, using an effects pedal here and there, but mainly making transcendentally pure music with his tenor sax, a single line of exploration. Yet right at the end of this breathtaking solo there’s a pause, a moment of doubt in which McCaslin laughs and exclaims "I’ve forgotten the riff!" before Wood charges in with the correct notes, and we’re into another fearless, high-energy collective performance. They generate so much heat that I hardly notice the temperature drop to –7°C as I step out onto 7th Avenue, still grinning from the pleasure of witnessing a great band at the height of their powers.